3 "Every mob NPC's locations on this wiki are arranged in order of level "
11 Creating pages for every variant of a type of foe. "Every mob NPC's locations on this wiki are arranged in order of level "
The three examples you gave me aren't even relevant to the discussion. For the Marsh Drake, there's no question to be asked about which comes first since the lower level encountered is in Kryta, hence why it's first on the list of locations instead of the Magumma Jungle (K = 7, MJ = 8 = Simple math). As for Marjo and Caithe, these are both story-related characters which we always put their current location at the top and the rest are in order of appearances and their level doesn't really come into play as it does for regular mob NPC you can encounter in the game at all time. Also, that's three (questionable) examples out of the whole wiki so I think my point still stands. About Marsh Drake: Queensdale, Caledon, and Metrica are all 1-15 zones. They are literally equal level zones. 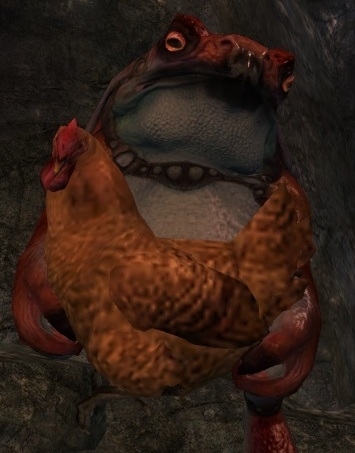 Kryta becomes before Maguuma because it's alpbetical, not because Queensdale is a lower level area. About Caithe and Marjory: No, they are not placed based on order of appearance. For example, Caithe's current appearances are in order: Dragon's Stand, The Grove, then the dungeons (based on level because dungeons = zones); Marjory's historical is Bazaar -> Sky Pirates -> ToN arc -> Origins of Madness. The story order was Sky Pirates -> Bazaar. And I also mentioned, though did not like, Braham which is showing order of F&F->Origins of Madness->Secret of Southsun->Escape from LA->ToN->Queen's Jubilee. There's no order of appearance there. I linked three, but they're examples. I will not go and list every single article like that just to prove a point (I also made mention - without linking - a total of 12 articles, not 3, but since you demand links: Logan, Zojja, Eir, Rytlock, Caithe, Rox, Braham, Marjory, Canach, Kasmeer, Taimi should all have that set up). "All NPC mobs has been arranged this way to my knowledge for quite a while" Here's the 'humor' - I can say the same exact thing about the way I've been doing it. "I personally don't see how it would be more user-friendly or just visually-friendly for that matters by having the levels all over the place." Another bit of humor: your way still has the levels all over the place. Drake Marsh is a prime example of this. You list Kryta which goes levels 1-60 then you list Maguuma which lists 1-70. "Also, they're not ordered as per the area's level they're in but as per the level they have when you encounter them." That's largely the same thing. "If you actually want go make the changes, feel free to do so to each and every page because consistency is important, you know." I'll be sure to do that to the ~500 out of ~10,000 articles. Was planning on doing such as I come across them anyways. Typically it's a matter of situation, not a universal "do not revert!" Sometimes edits simply do not conform to the common practice and when such happens they should be made to conform; if the common practice bothers you, rather than reverting someone making an edit to conform to common practice then you start a discussion. Further, rather than revert you discuss if there's a habit with the person reverting (either reverting you or in general) so as to point out the purpose of the edit (these discussions, I've found, oft result in stagnation). Ultimately, it's up to folks to make judgment calls. Creating pages for every variant of a type of foe. I'm just gonna note, "Non-rank mobs are all done that way while" isn't entirely true. It likely seems that way because many normal ranked mobs can be found in almost every level from 2 to 80. Unless it's just missing a handful of levels (for example, an NPC is seen at levels 2, 3, 4, 6, 10, 11, 12, 18 then it'd be fine to do '2-12, 18'), or it has such huge variances that listing them all would be too long (e.g., instead of '2-12, 18, 22-26, 50-60, 80' it would be reasonable to put '2-26, 50-60, 80' or even '2-26, 50-80'), it should be denoting actual levels it can be seen. Do note that from upscaling, an NPC can go up to 3 levels higher than what we see normally. Veterans are less often seen with a dash because they're much rarer and don't have nearly as many level variances. So in the case of Aatxe, the proper way to denote it would be '14-15, 34, 40' (the 40 because they appear in the Chapter 4 Priory personal story). Or if you include upscaling: '14-18, 34-37, 40' though '14-18, 34-40' would also be reasonable for shorthand). But 15 to 34 is a big enough gap, with few enough other levels presented, to not do 14-34. In large, it's a judgement call for whether the gap is big enough or not. Typically I only list upscaled levels (they're not really all over the place - there's an obvious system to it when you notice it) for events where it's expected for upscaling to occur, such as world bosses. You probably never got a notice for 'how we do things' because there really isn't much care about how its done so long as its legible. It should be ===[[Personal story]]=== not ;[[Personal story]]. I've been making these changes for months? (thanks to setbacks... like this... it's still not done) because this is better organization. And event involvement always has gone under story involvement. Please stop any such mass revisions reverting the work I've been doing. It's been part of the formatting guides for a long time (over half a year) and has been discussed (though I can't seem to find where - started when Alex reverted the changes I made to an NPC...). This page was last edited on 6 July 2017, at 12:44.